After a brief hiatus, this week’s bitcoin review takes a look at the increasing VC interest in bitcoin. Venture Capital investment is up 28 percent compared to last quarter, according to CoinDesk’s State of Bitcoin Q2 2014 report. This past quarter saw $73 million in VC investment, compared to $57 million from the first quarter of the year. And those numbers don’t even include this week’s major funding announcement: Xapo raised $20 million in a round from Greylock Partner and Index Ventures. Combined with an earlier funding round (also $20 million), Xapo leapfrogged BitPay to become the most well-funded bitcoin start-up, with the Wall Street Journal estimating the online wallet provider’s value to be “north of 100 million” now. So to who — and where– is all this VC money going? CoinDesk’s report shows North America in the lead for bitcoin investment to-date, with approximately $186.3 million (including Xapo’s round) going to 30 companies. Europe has now surpassed Asia in value of the investments ($30.9M compared to $20.8M), but Asia had 13 companies receiving funding to Europe’s five. That doesn’t mean the money is leaving Silicon Valley per se. Even though only 37 percent of all bitcoin companies are based in the Valley, nearly half of all VC funding to-date (48 percent) is going to those startups. When it comes to the companies that are getting the funding, the “universals,” as CoinDesk calls them, are in the lead with 25 percent of money to-date followed by wallet companies, like Xapo, in second with 22 percent. 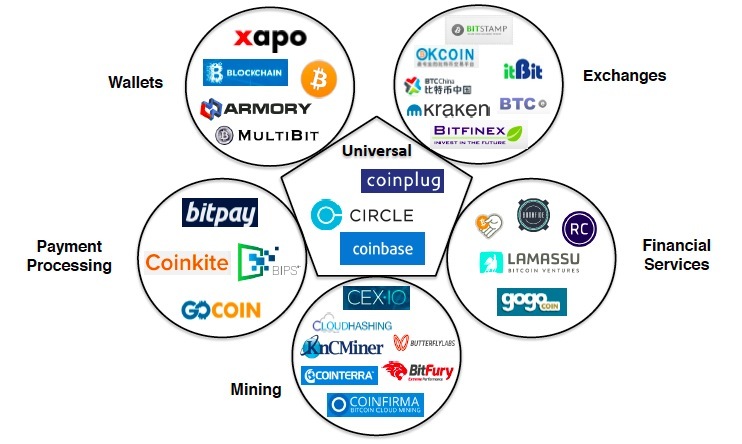 Universal companies are ones that have several functions, like how Coinbase is both a wallet company for individuals and a payment processor for merchants. Payment processors, like BitPay who had a large funding round of $30 million in Q2, have only garnered 16 percent of the bitcoin funding pie. Regardless of how it’s divvied up though, it wouldn’t be a leap to assume that pool of funding is only going to grow. Xapo coming out of the gate in Q3 with its second funding round is just one example. The slides from Coindesk’s report are below or you can find the full thing here. CoinDesk also keeps a handy document of all bitcoin venture capital investments for reference. The price of bitcoin still remains above $600, but if it continues in this downhill slide, it may not be that way next week. The market started the week around $640, but has since dropped to a closing price of $615.11 on Thursday. It’s rebounded a bit this morning and is currently around $625 as of 9am PST. Up for auction this week is the bitcoins.com domain. Disgraced MtGox CEO Mark Karpeles has decided to auction off the domain and split the proceeds with his creditors (although that’s likely a very small drop in a very big bucket of money he owes). Bitcoin is money, at least according to Ross Ulbricht’s judge. Wired reported that the judge in the Silk Road creator’s trial shot down two arguments from the defense: bitcoin isn’t money (so it can’t be laundered) and he can’t be accused of running a drug dealing conspiracy by just hosting a website. Bitcoin entrepreneur and foundation board member Brock Pierce launched a bitcoin competitor, Realcoin. The “Bitcoin 2.0” cryptocurrency is backed by the US dollar, according to the Wall Street Journal. Could bitcoin be the key to migrant savings in Kyrgyzstan? With last years remittance payment to the country totaling the equivalent of 31 percent of its GDP, one technologist is starting meet-ups and spreading the word of bitcoin in the central Asia country. BitPay, the payments processor, released Copay, an open-sourced, multi-signature bitcoin wallet. It was announced pretty unceremoniously on their blog, but the concept of a bitcoin wallet that multiple people can manage and sign off on how to spend (like a business requiring three accounting signatures before approving transactions) is actually one to cheer about.